There's a reason why Wallace Beery gets top billing over the likes of Richard Arlen and Louise Brooks in William Wellman's Beggars of Life. While he may not be the main character, he owns every second of that film. And he was the bigger star at the time, the role is so unglamorous (he's the villain of the piece for half the film), he makes the most out of a role that could have easily faded into the background. As Oklahoma Red, a notorious hobo who runs a gang of tramps, Beery is something of a minor miracle, providing a major stumbling block for our heroes, Jim (Arlen) and Nancy (Brooks), two young people on the run after Nancy shot the step-father who raped her. Loosely based on Jim Tully's autobiography of the same name, Beggars of Life is an often grim look at the life of a hobo (a topic that was both romanticized and vilified at the time), following two young people who desperately want out of the tramping lifestyle, and one avowed tramp who is redeemed by their love. Wellman's epic war film, Wings, went on to win the very first Oscar for Best Picture the same year, but Beggars of Life is perhaps a more impressive artistic achievement. While Wings is filled with stunning aerial photography and action sequences, Beggars of Life strikes a much deeper emotional chord. Brooks would later condemn Wellman's methods, after leaving for Europe where G.W. Pabst made her a star in his twin masterpieces, Pandora's Box and Diary of a Lost Girl in 1929. 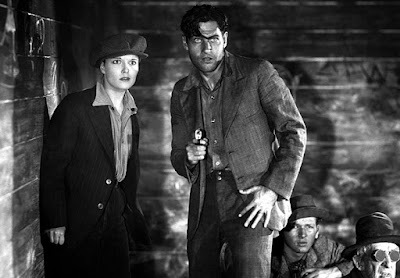 But it's hard to deny that Wellman extracted a magnificent performance from her here, even if she is relegated to being dressed as a boy and looking distressed for most of the picture. Few actresses of the silent era were as magnetic as Brooks, and she clearly knew how to command the screen with little more than a look. But it was Pabst who would truly lead Brooks to greatness. Here, Beery is undeniably the star; taking a gruff, lecherous character like Oklahoma Red (who initially takes in Jim and Nancy with an eye for forcing himself on Nancy), and turning him into an unlikely hero - a complicated man with conflicted emotions whose heart is reached by a tale of true love. It's a beautiful performance, filled with wit and soul, perhaps one of the greatest of the silent era. 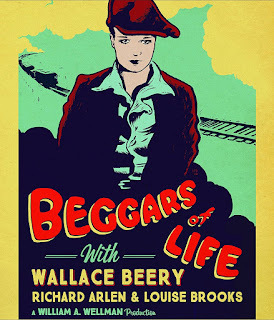 Beggars of Life features some fantastic action sequences (beautifully shot by Henry Gerrard, also responsible for the evocative camera work on Ernest B. Schoedsack's 1932 adaptation of The Most Dangerous Game), but it is Beery who is the heart and soul of the film. In an era when emotions were often theatrically projected to the cheap seats, Beery created an indelible character whose journey feels wholly realized and painfully real. Kino Lorber's new Blu-Ray features a gorgeous restoration that perfectly captures Gerrard's lovely framing and melancholy imagery. It's one of Kino's best Blu-Discs yet, featuring an in-depth essay by Nick Pinkerton, as well as two audio commentaries featuring William Wellman, Jr., and Thomas Gladysz, founding director of the Louise Brooks Society. They offer illuminating insight into a forgotten gem of the silent era that is now ripe for rediscovery.